They call it "Le Cube." It's the new decoder from our satellite television provider. We've had the old decoders for nearly seven years now. One was a PVR (Personal Video Recorder) called PiloTime. It gave us forty hours of recording time, but the interface was slow and awkward, and the thing was dying a slow death. One of the boxes that our new satellite decoders came in. The other decoder was not a PVR, but it, too, was losing functionality. So we decided to upgrade with the new attic work so that we would have two new decoders and the ability to record either upstairs or downstairs. The new Le Cube gives us eighty hours of recording time and has a new, more user-friendly, interface. The new remotes are shiny and clean have no buttons missing. And all Ken had to do to get them was take the old decoders in to a store and exchange them for the new ones. Easy-peasy. 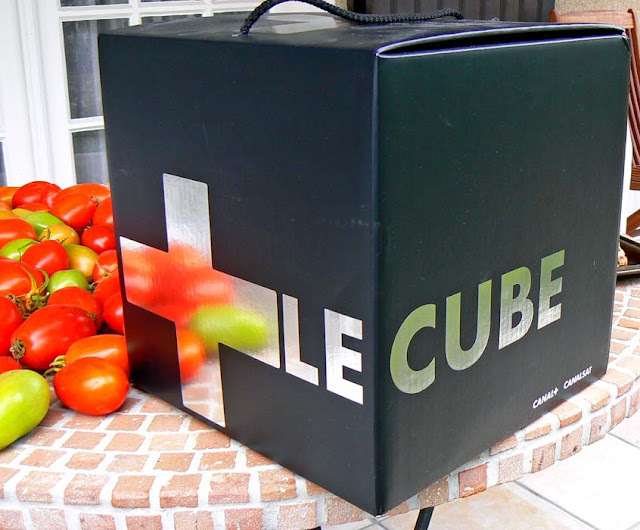 By the way, Le Cube is not a cube. It's a standard polyhedron that's mostly white, with one corner in black that suggests the shape of a cube. But the box it came in is a cube. A very stylish cube. It took about a whole day to hook them both up, run the setup programs, download stuff from the satellite, and figure out how it all works. But we're getting used to them now. Hey, that's one heck of a zoom lens! Ok, it's not the moon. It's the dirt road out back that runs through the vineyards. I'm pretty sure there are no acorns on the moon. But there are plenty under the oak trees all around. They're competing for space with the walnuts, hazelnuts, and chestnuts. This acorn had probably just fallen. Then next day I noticed it was crushed. Probably by a tractor tire. And the squirrels are competing for the nuts with the humans. We've pretty much given up on our hazelnut crop these past few years. The nut weevils and the squirrels get most of them. I don't want to give you the wrong idea; we're not overrun with squirrels. I see one or two at most every now and then. But when I see them, they're in the hazelnut trees. Pizza is one of my favorite foods. Especially French pizza. I'm sure I would love Neapolitan pizza, too, but I've never been to Naples. So for me it's French style individual pizzas. I've been making pizza at home for close to fifteen years now, if not longer. I have two pizza stones for the oven, a peel, and a small collection of recipes for crust. One of Sunday's pizzas, ready to be sliced. My current favorite crust is based on a recipe from our friend Tom who lives in Illinois. He had a wood-fired pizza oven built into his kitchen not too long ago. When we visited Tom and Harriett in 2006, they treated us to their home-made pizza. Un vrai régal, as they say in French! Sunday's pizza was made with the rustic tomato sauce I made last week. I ground up a couple of small steaks along with some smoked lardons (bacon) and sautéed them with onions, garlic, and some chopped eggplant from the garden. That all went into a pot with the garden tomatoes, herbs, and spices. We ate it on pasta last week, but we both thought it would make a good pizza. I didn't take the sauce all the way to the edge of the pizza this time because it was thick with meat and eggplant chunks and I didn't want that to spill over on to the stone. So I kept a little bare crust around the edge. We topped the pizza with black olives and two kinds of grated cheese. One was mozzarella and the other was a dry Wisconsin cheddar that we were recently given. I made two pizzas and they were excellent (if I do say so myself). Served with a green salad they made a terrific Sunday lunch. 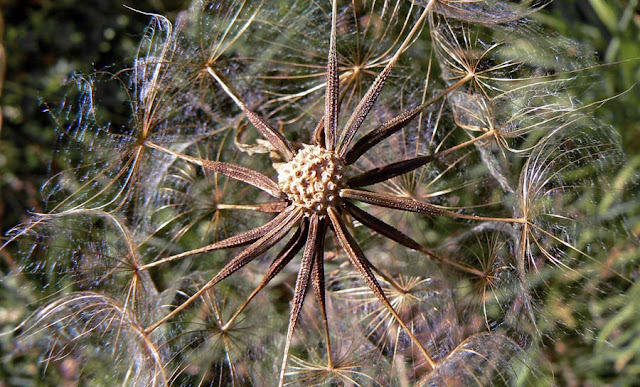 Summer's wildflowers have set seed and are drying into brown ghost skeletons. The coming winds, rains, and snows of winter will beat most of them down, but a few will survive upright into spring. I wonder if this one will? The last few seeds of this spent flower are still holding on. We ate the last best corn on the cob Saturday. There are a few more ears out there, but they're small and probably not fully formed. Ken read about doing corn in a skillet, so we did. Melted a little butter and put the corn right in, turning it frequently, covering it a little, until it was done. Then salt and pepper. But no fiddling with buttering a hot corn cob at the table since they were cooked in butter already. And the corn had a firmer texture than it does when it's boiled. Very good. 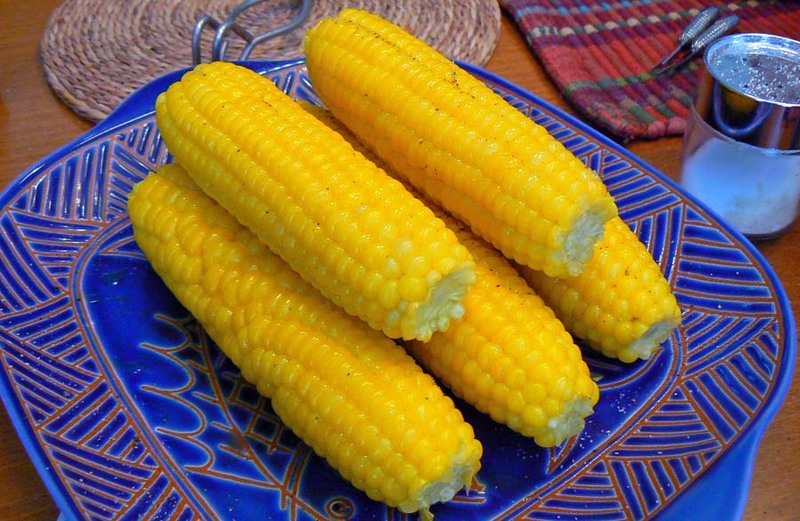 And, thanks to a suggestion from one of Ken's readers, we gave Callie one of the cobs after we ate the corn from it. She chowed down and consumed the whole thing in about five minutes. Happy days! I was going to put a higher number in the title, but then I just couldn't bring myself to do it. So while it's not the number one reason we live here, it's very close. Living within reach of a wine producing region is great; I've lived in Upstate New York, Washington, DC, and San Francisco, CA, all close to wine production. I think these might be côt (a.k.a. malbec) grapes. But now I'm living among the vines. The growers and wine makers are my neighbors. I watch the transformation of the vineyards through the seasons of the year from my windows. I walk among the vines nearly every day. I know the sights, the smells, and the tastes (yes, I pluck the occasional grape) of the vineyard. I share it with dogs, cats, pheasants, foxes, and deer. And I drink the local wines, almost exclusively. 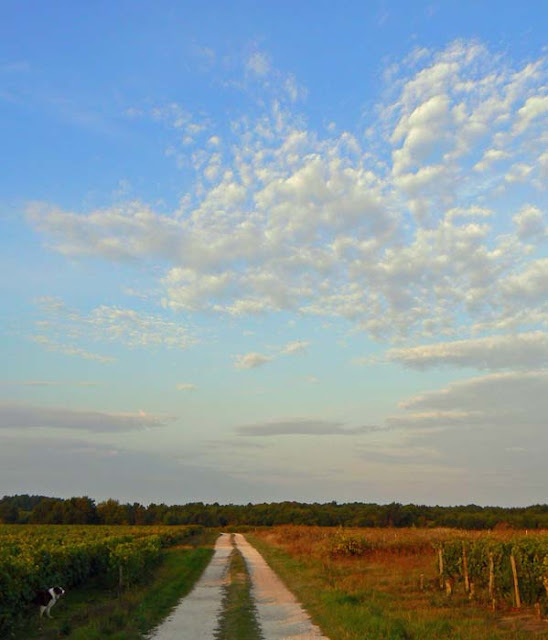 The Touraine region is rich with wine styles. Red, white, and rosé. Dry and sweet. Still and sparkling. The local varietals include gamay, cabernet, côt, sauvignon, chardonnay, and chenin. There are also several old varietals grown around us with less familiar names like pineau d'aunis and grolleau. Many of the people who grow grapes and make wine in this region descend from generations of winemakers. A lot of them are small and medium sized producers. When you visit a winery here, you will likely be talking to the winemaker or a member of the family. It's a very interesting and a rather delicious place to live. You can read what I wrote four years ago about our wine country lifestyle here. 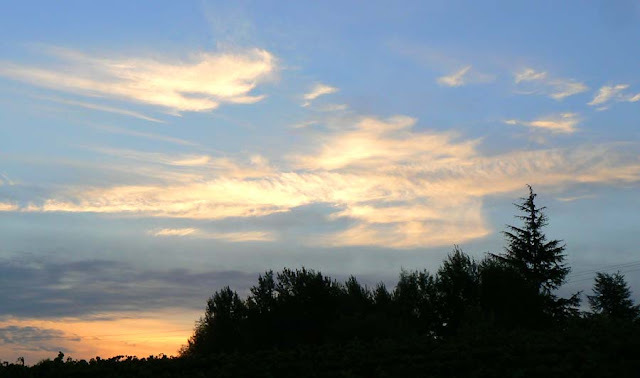 While the sky was not particularly dramatic on Thursday, it was still pretty. I thought I'd record the sunrise on the first day of fall. It was a warm morning which made the daily walk with Callie very pleasant. Looking easterly toward the sunrise at around 7:30am. The grape harvesters were out at first light and Callie didn't want to go toward them, so we walked around the vineyard in the space between the vines and the woods. That took us in a wide loop around the menacing machines. Looking toward the west. Callie's listening to the hum of the harvesters. Once beyond the vineyard parcel where the closest harvester was working, we got back on the dirt road and headed westerly. I could hear harvesters over on the next hillside to our south and out in the vineyards beyond the end of the dirt road to the west. Callie kept a sharp eye out for them in case they decided to turn and attack. The harvesters showed up earlier this week to begin les vendanges for the 2010 vintage. There are some hand pickers out there in certain parcels, but most of the grapes are picked by machine. The big harvesters ply the rows, vibrating the grapes from the vines. Their hum sounds eerily like the vuvuzelas during this year's World Cup, only with more vibrato. Harvester on the left, waiting tractor and trailer on the right. When the bins on either side of the harvester are filled up, the driver dumps the grapes into a waiting trailer. When that fills up, another driver takes the grapes back to the winery while the harvester continues on. Then he returns with the empty trailer for another load. The full harvester makes its way toward the trailer to transfer the picked grapes. This will be going on now for a few weeks. Then, sometime around the first of November, the first fermented grape juice will show up in the markets in the form known around here as bernache. It's not wine yet, but a fizzy taste of things to come. And it's renowned as a great cure for constipation. Remember when I talked about needing lamp parts? Well, I got them. To recap: we have several lamps that we brought from the U.S. seven years ago and their shades are in bad shape. But French lamp shades don't attach to the metal harps that these lamps were equipped with. So I needed to remove the harps and also replace the sockets with the French style for attaching new shades. A new lamp socket (the white part) for an old lamp. I was certain that this simple re-wiring would turn into a huge problem because I assumed that French lamp parts would probably not be compatible with the American lamps. But guess what? Everything fits just fine and now I have two old lamps re-fitted and ready for new shades. One interesting thing: the new sockets don't have those little knobs on them where you turn the light on and off. Come to think of it, I don't think any French lamps have those knobs. 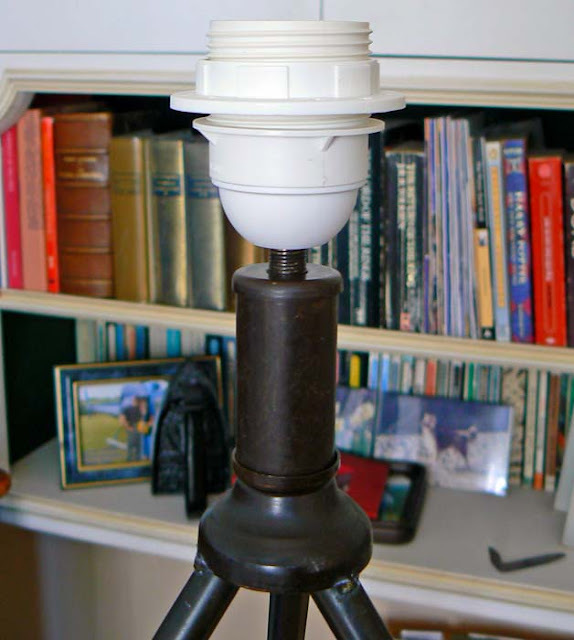 It makes sense in a way; no reaching in under a hot bulb to turn the lamp off. Instead, most lamps have a switch on the cord. The floor lamp that I re-wired already has a switched cord. We installed that years ago. But the desk lamp doesn't have a switch, so I will install one. They come in white, brown, gold, and black so you can match them to your cord. This cord is brown, so a brown switch it is. And, in case you're wondering, we cut off all the American plugs and replaced them with French plugs as soon as we moved. It's much more economical and cleaner looking than buying and using plug adapters. Well, not exactly pickled. More like preserved. These are part of our chili pepper crop, the long yellow peppers, that I packed in vinegar on Monday. I could have left them on the plants longer and they would have turned red. But I noticed several of them were beginning to soften and rot, so I figured that I should get them in and preserved before more went bad. 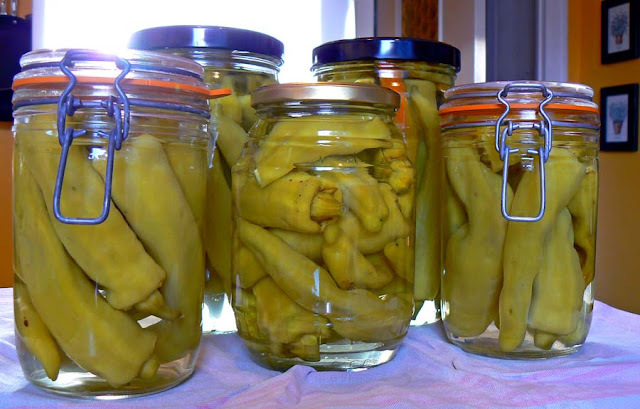 Five big jars of hot yellow peppers, ready to go into the cellar. About half of the cayennes had already turned red when I harvested on Sunday. I left the green ones out there a while longer to see if they'll also turn. If not, green cayennes are good, too. And the jalapeños could have stayed out to turn red as well, but I didn't want to take a chance on losing them to the cold nights, so I picked 'em green. I'll be preserving them all the same way. I clean them up, pack them into jars, then pour boiling vinegar in to fill the jars and seal them. I puncture each pepper with a skewer before packing so that the vinegar will flow inside and the air will come out. We did a big crop of cayennes this way four or five years ago and they are delicious. We're just finishing them up now, so this harvest should do for another few years. Monday was hardware day. We needed a bunch of little bits of hardware, so we planned a trip to our local BricoMarché to see what we could find. We loaded up the car with a bunch of junk and made a stop at the dump on the way. Got rid of tons of cardboard, some old paint cans, and the remnants of two old laptop computers. Now we have more breathing room in the garage. Home-grown jalapeño, cayenne, and long hot chili peppers. After the dump, we spent about an hour in the hardware store looking at hinges, screws, lamp parts, closet rods, and other stuff. We bought a bunch. Then we went across the street to the Intermarché grocery store and bought some food things. And more hardware from their hardware section. On Sunday we harvested most of our chili peppers. On Monday afternoon we began to clean up some jars for them. They'll get washed and packed into the jars, then we'll pour boiling vinegar over them and seal them up. We've got jalpeños, cayennes, and hot banana peppers. They'll last us a good long time. Today I'm planning to start cutting firewood for the upcoming winter. It's a bit late, but the weather is supposed to be good for the next few days, so I'm hoping I can get most of the cutting done. I'll keep you posted. And just so I have a record of it, I'm making a note here that the grape harvest started today in the vineyards out behind our house. On Sunday there was a fox hunt in the woods and vineyards that surround our house. When the fox population gets too large it becomes a public nuisance; wild foxes prey on game and domestic animals alike. Official hunts are organized periodically to thin down the population. So on Sunday, several hunters showed up around seven-thirty in the morning and took up their positions along the road that runs out through the vineyard. After about an hour we could hear dogs barking and a few gunshots here and there. And a few hours later, the hunters went home for lunch. The drainage pipe runs parallel to our road along the base of the hedge. Sometime after lunch, a new crew of people that we did not recognize took up positions along the road, not out in the vineyard, but close to the houses and right outside our kitchen window. I noticed one of our neighbors outside in an argument with one of them. He was on his hands and knees with his head stuck into her hedge. "Go away," she said. "I don't want you here." I went downstairs to see what was going on and if I could help. Ears to the ground, listening for the muffled sounds of a barking terrier. "Madame," I heard him say, "I'm in the public right-of-way and I have the right to be here." But why was he there? Our neighbor was upset. Then I noticed that there were about six or seven guys and a couple of women up and down our road, all looking very concerned and busy. I asked one of them what was up. The digging begins. The other terriers listen from their cages on a trailer. A fox, he told me. A fox had crawled into the drainage pipe along our road and one of their dogs, a fox terrier, had followed it in. They needed to get it out. Them out. The fox and the dog. I walked up the road to where the drainage pipe starts and I could hear a dog's bark coming from inside. That was a very weird sound. I went into the house and got the camera. I asked the guys if they minded if I took pictures. "Pictures for what, for whom?" they asked. I said for me. One guy said that it was ok, but as soon as they got the fox out, there were going to kill it, to faire l'affaire is how he put it, and that I shouldn't take pictures of that. Ken said I should have told him that I was in the public right-of-way and I had the right to be there. One of the guys explaining things to a small crowd of neighbors that gathered to watch. After a while it was clear that the dog and his quarry had moved farther down the pipe and were right in front of our neighbors' house. I could hear the muffled barking of the dog from under the ground. That was a very strange sound. 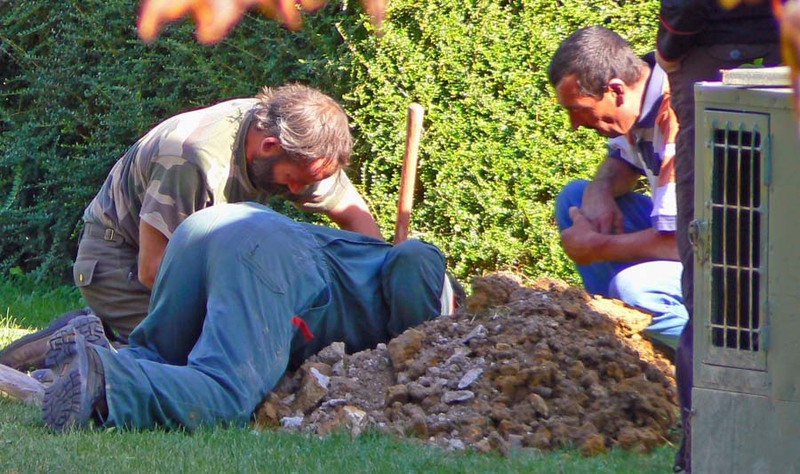 The guys were calling the dog and putting their ears down to the ground to try to hear where the dog was. The guy is green is calling into the pipe, giving the dog instructions to push the fox on further. Then they started digging. They opened up a hole near to where the barking was coming from. They succeeded in moving the animals farther down the pipe with the help of un hérisson, a wire brush like what's used for chimney sweeping, attached to a long flexible pole. Not far from where they dug there is what's called un regard, a kind of mini manhole that opens into the pipe. The guy stationed there saw the fox go by and the dog following it. 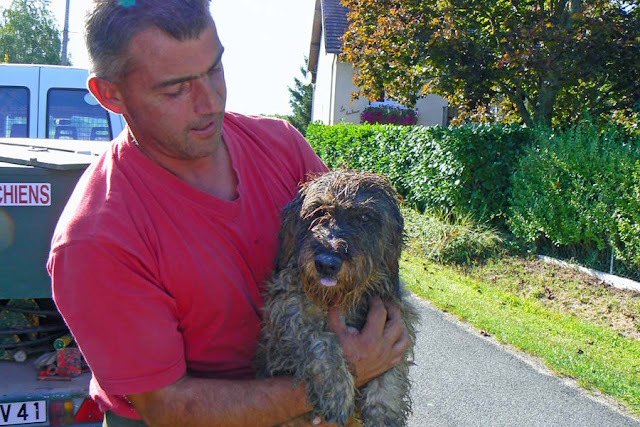 He managed to grab hold of one of the dog's legs and pulled it out of the pipe. And the dog is out! But where is the fox? It was a little tiny fox terrier named Hugo, just doing his job. He was filthy brown from being inside the pipe. And he drank a bunch of water after his several hours having cornered a fox. But all was not finished. The guys were not about to let the fox go, and it had made its way further down the pipe. They kept at it. And Hugo was running around barking into the holes. At one point I thought they had let him go back in, but I'm not sure about that. Little Hugo was tired and dirty, but not the least bit frazzled. He was just doing his job. I have no idea whether they got the fox or not. 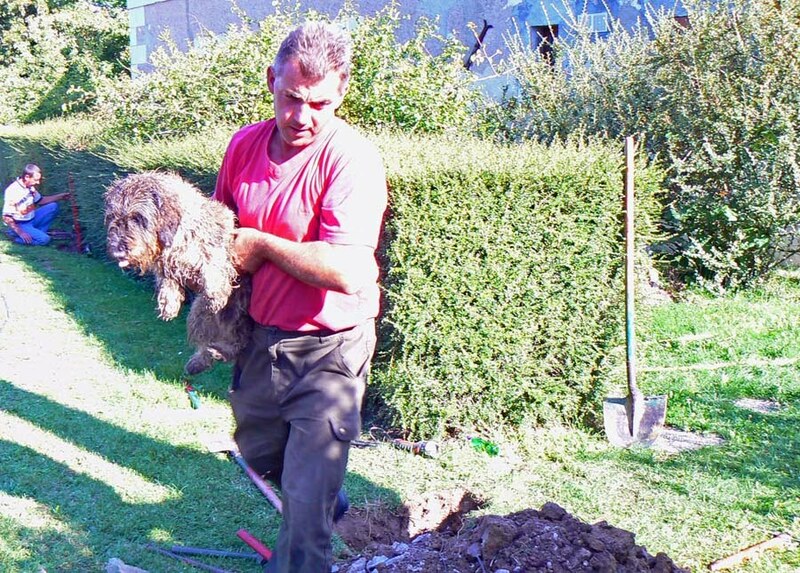 I was very happy that the dog was safe and stopped paying attention to the whole thing after he came out of the pipe. I figure that, at some point, you just have to say that the fox has won and let him go for another day. It really is that time of year. 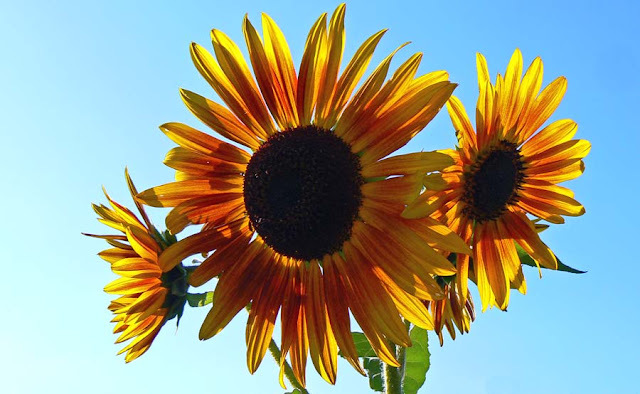 The large fields of sunflowers around us are mostly brown, the seed-laden flower heads bent toward the ground. They look like a crowd of mourners at a funeral. I'm seeing sunflower photos all over the internet. And here's me adding to them. The sunflowers in our garden are on their way out, too. These are a couple of late bloomers hanging in there, but they won't last much longer. One good gust of wind and they'll come toppling down. Today we're planning a chili pepper harvest. And eggplant. This morning's low was 7ºC which is about 44ºF (and 280º Kelvin, in case you're wondering). With these low overnight temperatures the veggies aren't going to last too much longer out there. But the daily highs are supposed to get into the mid 20s (low 70s F) through the week. We're going to make a moussaka for lunch today. Yum! I recently realized that I haven't been making as many tartes (pies) as I have in the past. I don't know why. One reason is that Ken has become very interested in making cakes, both sweet and savory. Maybe those sweet cakes took the place of my pies. An apple tarte made with apples from one of our trees. This week, however, I'm back in the saddle. 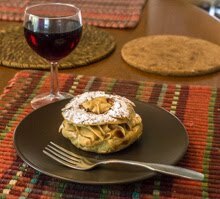 I made two apple tartes. And I'm hopeful that as we move into autumn, I'll be making more and more of them. You know the rest. 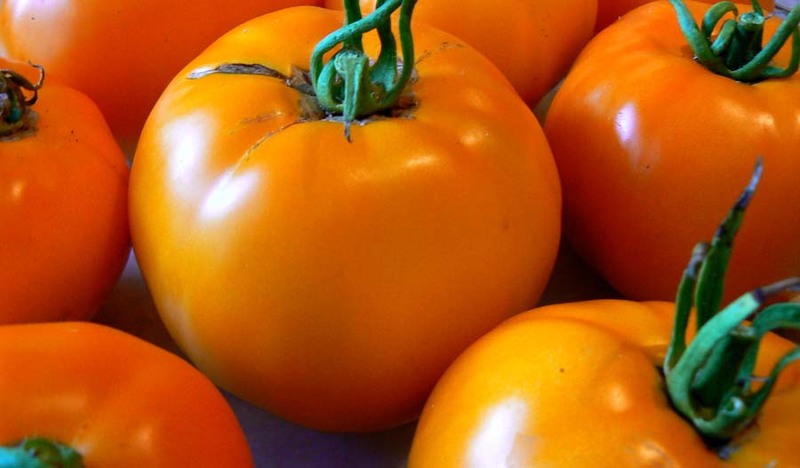 We're eating a lot of tomatoes right now. From the garden. In sauce, on sandwiches, in salads, on pizzas. And they're delicious. We've got round reds and roma reds, and we've got beautiful round yellows. Except that those turn more orange-y than yellow. Still, they're meaty-good! Yellow tomatoes from the garden. There is still a rather large crop left on the plants that's just about ready to pick and be processed into sauce. We'll probably tackle that this weekend. We're still working, little by little, on the re-arranging of the house. Ken is cleaning and re-varnishing old furniture like end tables and plant stands. Yesterday I cooked. I made creamed corn from some of our fresh garden corn and an apple tart. Both turned out very good. In fact, Thursday's lunch included potatoes, corn, tomatoes, and apples all from the garden. It won't be long before it's time to start pulling up plants and preparing the beds for winter. Many of the lamps we have came from the U.S. Table lamps, floor lamps. And more than a few of them have that metal thing (I think it's called a harp) for attaching the shade to the lamp. And many of the shades on those lamps have seen better days. So I need to go shopping for new lamp shades. 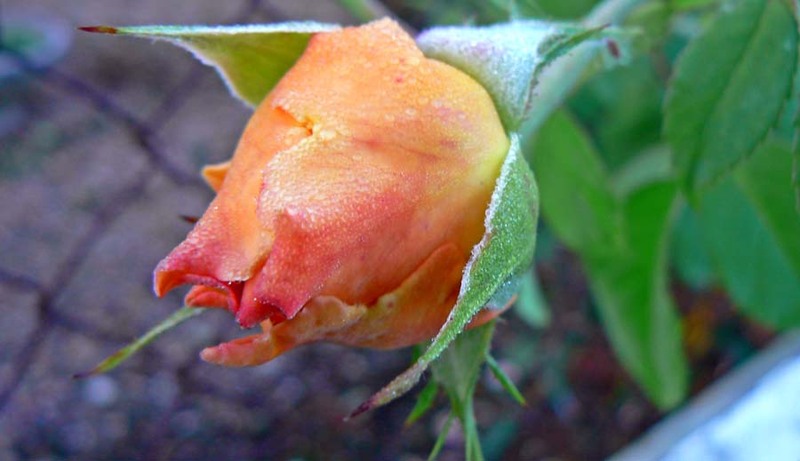 A rose bud on a late summer morning. But in France, lamp shades are not attached to lamps with that metal harp contraption. In France, lamp shades are attached via a screw-ring around the base of the bulb socket. Are you still with me? French lamp shades will not attach to my American lamps, at least the ones with the metal harp contraption. So now I have to go to the hardware store and look for lamp parts. I need to replace the bulb sockets so that I have the screw-ring on which to attach new lamp shades. Then I have to take my lamps apart to install and wire up the new bulb sockets. Anybody want to wager that this will not be as simple as it sounds? Anybody want to wager that American lamp parts and French lamp parts might be very close to, yet not exactly, the same size? The house is all jumbled up. Yesterday we moved the living room furniture upstairs. Well, most of it. The big sectional sofa thing went up to the new space. The chairs stayed down. We'll be adding a couple more chairs to the living room to make a less-cramped sitting room. That will be the "public" part of the house, while the loft will be our "private" space. 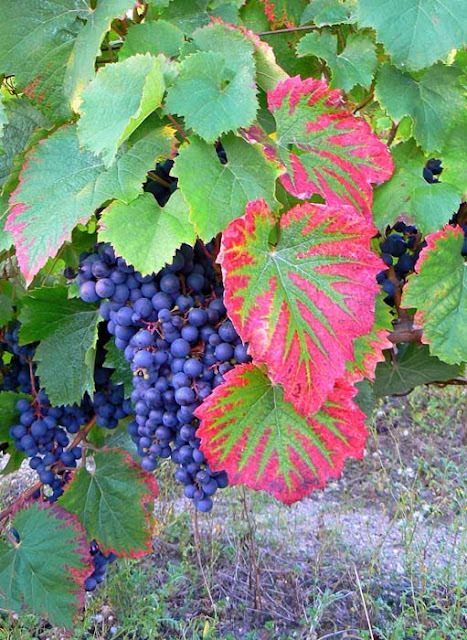 Grape leaves are starting to show their autumn colors out in the vineyard. As the furniture gets moved, I'm cleaning and mopping the tile floors beneath before putting it back together in the new configuration. Today I intend to work on the dining room side of the great room. Again, the dining area will gain a little more space around the table, making things seem much less cramped. I think Ken is posting photos of the loft space today here. I'll have pics of the reconfigured living/dining areas once that's all put back together. We're making great progress and the cleaning is feeling really good -- we skipped spring cleaning this year because of the construction work. We spent last evening on the sofa in the new space. A couple glasses of wine, some toaster oven pizzas (sandwich bread with fresh tomato slices and mozzarella), and Casablanca on the DVD player. Here's looking at you, kid. On Monday morning our plumbing/electrical contractor came by to connect the new satellite tv cable he installed to the actual satellite dish, thus permanently moving the signal from the ground floor entry up to the new loft space. Ken had called him last week to let him know we were ready. An althæa in one of our neighbors' yard. 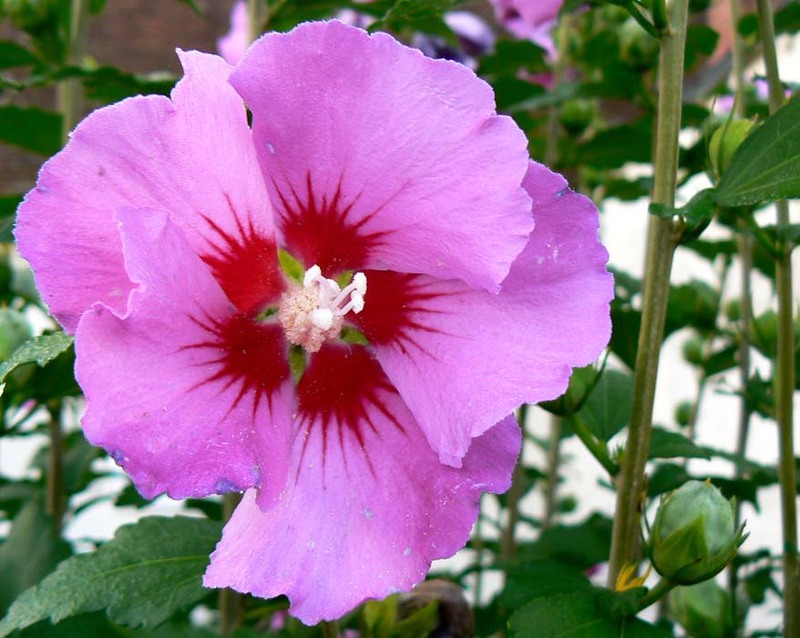 It's a kind of hibiscus. It wasn't the actual plumber who came to the house but his two employees who do most of the labor for him. While they were here they said they wanted to go ahead and install the radiators (up until now being stored in the closets) and get the heating system up and going. It's starting to get cold in the mornings. We explained that we're not ready for the heating system to be up and running yet because we need a new part for the boiler and the heating people need the system to be empty to install it. Our heat is oil-fired hot water and the part we need is an expansion tank that regulates the water pressure in the system as it heats and cools. The water has to be all drained out of the system (all the radiators and pipes in the house) for the installation to happen, and we drained it all last week. It would have been silly, not to mention wasteful, to fill the system up to test the new radiators just to turn around and drain it again. So the guys installed the radiators and said they'd come back when we're ready to test it all out. It's nice to have the radiators up on the wall now. They make the room look even more finished. Now the tv is up there and working and we're beginning the process of moving furniture. This caught my eye the other morning as I was walking through the vineyards with Callie. I've shown pictures of this antenna tower before, but on this particular morning at this particular moment it took on a new look. 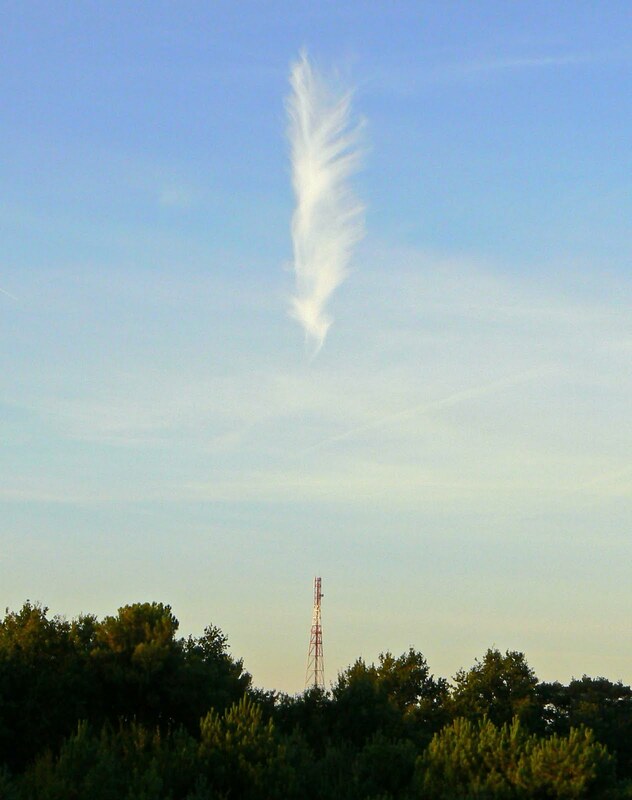 Is that a feather in your cap or are you just happy to see me? It wasn't long before the cloud moved and changed shape and the illusion was over. Yeah, but have you ever seen a b-corn? It's acorn season. 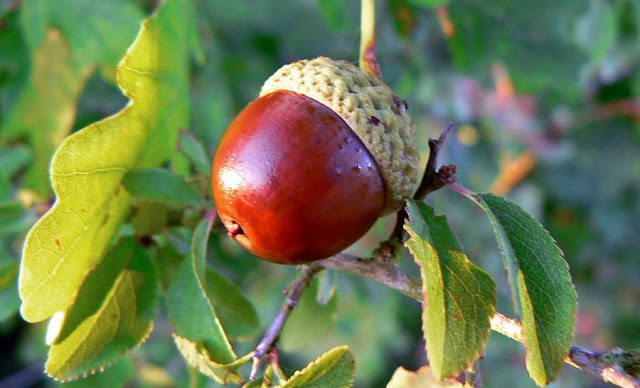 And chestnut season. And walnut season. The newest of the nuts are beginning to fall from the trees. They're still mostly covered with their protective outer husks. Walnuts are round and smooth and green with little brown splotches on them. Chestnut husks are covered in sharp green spikes. But the acorns look like acorns. They're not hiding inside protective covers. An acorn ripening on its tree out by the vines. I've never heard of eating acorns. Early humans did. And apparently some cultures around the world still do, but not many. Have you ever eaten them? Not me. It's too bad, because they're out there and free. They're probably way more trouble to deal with than they're worth, otherwise more people would be eating them. But they are a significant food source for wildlife, so it's good that the critters don't have to compete with humans for them. 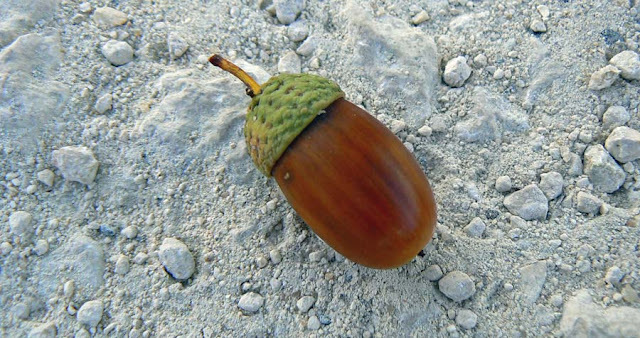 And besides, acorns are where little oak trees come from. From a distance, and especially if the skies are misty or hazy, you could mistake this silo (granary) for a cathedral. It sits down in the river valley along side the railroad line that serves us. And although at times it looks abandoned, it is quite active in the harvest season. The grain silo seen from the valley floor, just down the hill from our house. Corn and wheat and other grain farmers in our region bring their crops here for storage (and possibly sale?). From time to time I see grain being loaded into railroad cars for shipment to who knows where. A closer view of the silo, with a water tower on the heights beyond. The river runs by just beyond the little house in the foreground. You can see grain cooperatives and large silo complexes like this one all over the countryside where grains are grown. Agriculture is very important in France and it's practiced by many small and medium sized growers, thus the existence of so many co-ops. 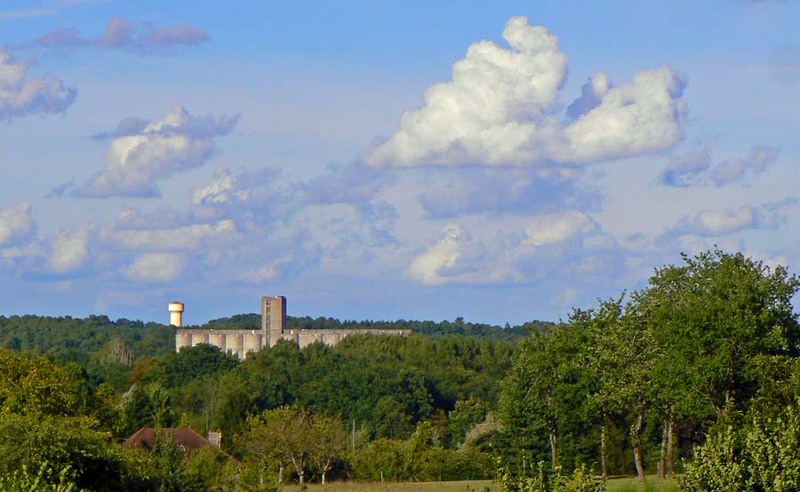 Large-scale industrialized food production is gaining ground in France, unfortunately, but it hasn't won out yet. And for that we are very grateful. It's called arion rufus, the red slug. But the ones I see are mostly bright orange, like this one. They live mostly in the woods around the vineyards, preferring the dark and moist ground to the bright sun. After our recent rains, the paths through the woods are crawling with them. If it weren't for their bright color, it would be easy to step on them. Yuck. A red slug climbing up an embankment. One interesting feature of land slugs is the pneumostome or breathing pore. When it's wide open, it looks as if something has taken a huge bite out of the slug. In fact, when I saw this one (below) I thought it was injured or sick. But it turns out that it was just taking in the fresh woodland air. This slug's pneumostome, wide open, is visible just behind its head. This is another example of how amazing and useful the internet can be. 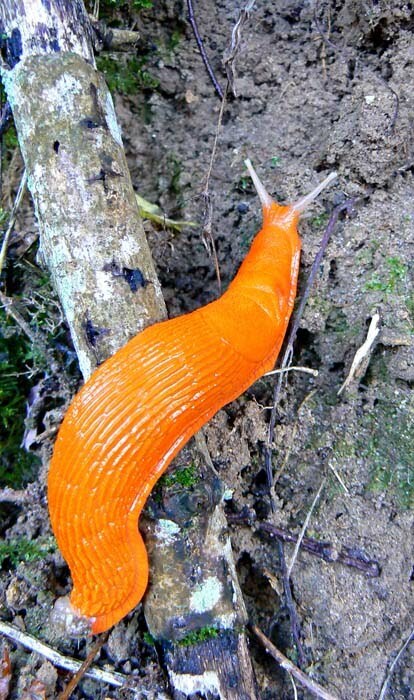 I was able to type "orange slug" into Google, then find all kinds of information about what this creature is called, where it lives, what it eats, and what that big gaping hole on its side is for. I really should call this sporadic puppy pics, but it just doesn't roll off the tongue as easily. Here's Callie about halfway through her afternoon walk on Wednesday. 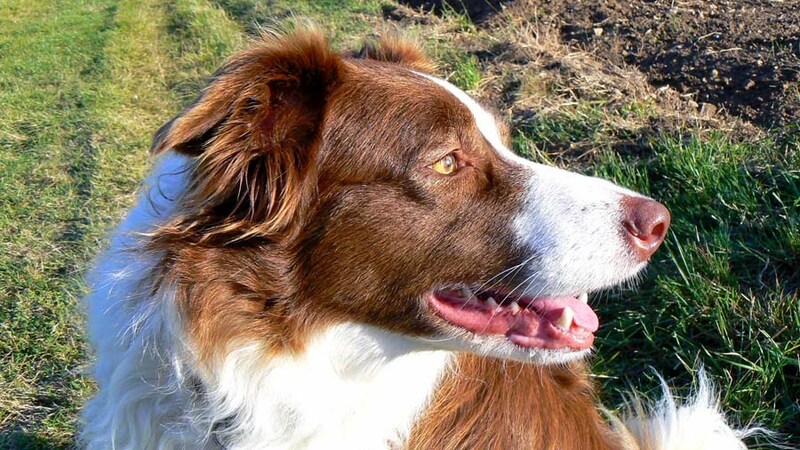 Happy and looking around for signs of deer, rabbits, cats, and hot air balloons. I wonder what she thinks she sees out there? The summer high pressure systems are breaking down over western Europe, letting the Atlantic weather fronts dip down into France. This is the autumn and winter pattern taking hold. And it brings us rain. The tall sunflowers we planted this year behind the sweet corn are now in full bloom. In this transition period between summer and fall, we get nice weather for a few days, then a cold front brings clouds and rain. Grape growers have to be thinking and testing and planning for when to roll out the harvesters. Home gardeners have to watch their tomatoes and get them in before too much water causes them to split open. The tallest sunflowers in our vegetable garden are starting to dry out and produce seeds. There are still some smaller sunflowers that are just about to bloom. They're very late, but it's been that kind of year. We're starting to pull in the bulk of the tomato crop now. And yesterday I noticed that we have a decent crop of jalapeño peppers among all the peppers we planted. On calm and clear evenings we can often catch a glimpse of a hot air balloon as it glides by. Sometimes they come right over the house, enticing all the dogs within earshot to bark wildly at the big thing in the sky. The unmistakable whoosh of the balloon's burner is always heard before the balloon comes into view. I watched the balloon through the treetops from our deck. One particular morning a few weeks ago, I heard the whoosh and looked out to see two balloons going by in the distance. As the burners lit up, both of the balloons glowed fainlty in the dawn light. I didn't have my camera at the ready, and without the tripod set up I don't think I would have gotten a good photo of it. My cousin Mark is an accomplished artist. I've seen one of his shows and I regret missing another. He's a talented guy. And part of his work captures our home town of Albany, New York, one of my favorite subjects. I recently bought a print of one of his paintings and it arrived this past weekend. The Daily Grind by Mark Gregory. I'm very excited and proud to have one of Mark's works. He joked about how my purchase was his first international art sale. And now his art will be hanging in France. How cool is that? This one is called "The Daily Grind." It's the name of a coffee shop in downtown Albany. If I'm not mistaken, Mark included a self-portrait on the lower left; he's pushing what looks like a few cases of wine on a dolly. Like I said, he's a very talented guy. I'm not prejudiced or anything. Check him out here. To me they look like cactus growing out of the scrub in some desert. 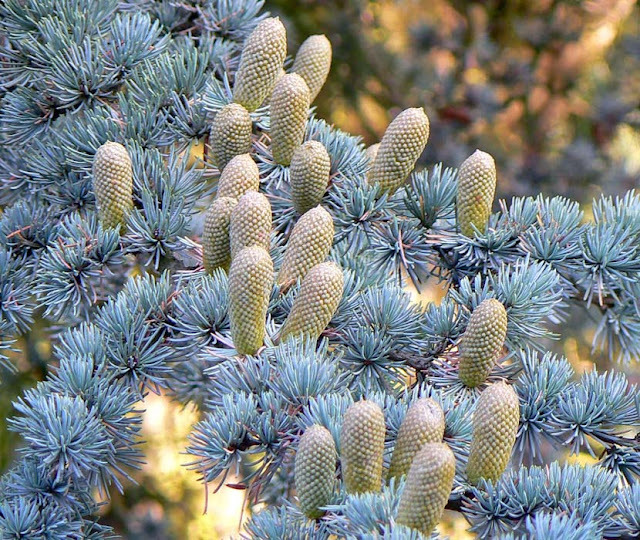 In reality they're new pine cones growing on the fir tree outside the window of the den. The cones are less than two inches long and they won't get much bigger. When they fall they'll litter the ground and will have to be raked up. Fresh pine cones growing on one of our trees. I've made some more progress in the attic by painting the closet doors, hanging them, and removing more tape from the floor and beams. We've taken some rugs up in anticipation of moving furniture up there real soon. Ken moved his desk and computer up, too. Today we're invited out for lunch in nearby Couffy. 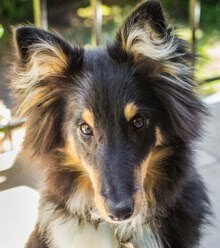 There will be dogs in attendance and Callie will have fun playing with friends. Mostly they'll just lie about after some getting-reacquainted sniffing. We should see the afternoon high near 26/27ºC (almost 80ºF). Here's what our sunrise looked like on Friday morning. A perfectly clear sky and not a jet trail to be seen. The morning was chilly, but the day warmed up nicely. Standing in the vineyard looking east toward our house at around 7:15 on Friday morning. I'm enjoying these days that are giving me an opportunity to get back into the garden work. There is so much to do but it will get done when it gets done. We're still cleaning up after the construction and painting and are beginning to move furniture around. And there's still the winter wood to cut. But I'm not stressing. I have wine. It's still summer and the weather is summery. At least the afternoons are. We're having a great streak of sunny, warm, and dry days. The vegetable garden is loving it. Squash are still coming in and we're eating fresh tomatoes daily. Ken made a great gratin with eggplant, tomatoes, and zucchini the other day. In fact, he made two. One goes into the freezer. Home-grown sweet corn on the cob with olive oil, salt, and pepper. And I've been harvesting corn. This is the second meal of corn on the cob that we've had so far, and there are more in our future. I'm very happy that the corn is successful and I'm encouraged to plant more next year. Corn on the cob is not a staple in France. Most of the corn grown here is feed corn. You can sometimes find sweet corn on the cob in specialty sections of the supermarkets, shucked and shrink-wrapped and very expensive. 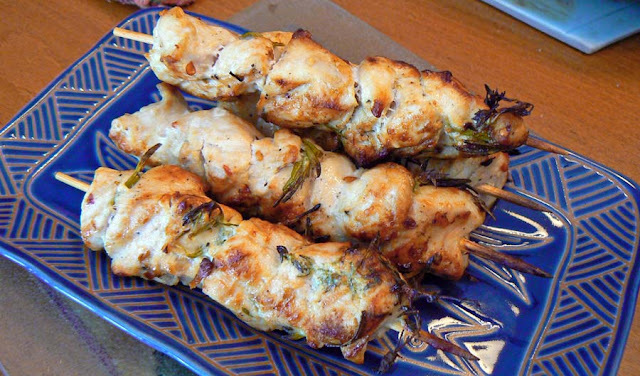 Chicken breasts marinated in white wine, olive oil, and garden herbs, skewered and grilled. I'm not sure how most of the French people we know would react to a cob of corn on their plates. They'd probably try to attack it with a knife and fork and be thoroughly amused to watch us Americans just pick it up and eat it. Vive la différence! Callie came home from Wednesday's morning walk covered in burs. Covered. She had them on her legs, on her belly, in her tail, on her neck, and behind her ears. I spent ten minutes with her dog comb trying to get them all out before giving her the morning rinse-off. See the little hooks? These are some of the more common burs that Callie picks up. All it takes is one little detour through the right (or wrong) field or through the brambles and she picks them all up. She even found more burs later in the morning in our own back yard. I'm not certain where they are, but she found them. This is not a new thing. I've been telling her since puppy-hood when she's got "a bur in her fur." She knows what that means and will stand still for me to get them out. Usually it's just a few, but this time of year, well, bounty. If only they were edible. I also looked up "bur" in my Webster's Unabridged Dictionary to find out if it had one "r" or two. Apparently it can be spelled either way, but I got the impression that one "r" is more common. Was that Miss Muffet I saw running in the vineyard? Or was it August, high-tailing it out of here? Either way, September has arrived. I think the summer feels short this year because it started late and because we've been concentrating on the attic work and not much else. We still have three weeks of summer left and are hopeful that the weather will be good so we can continue harvesting our garden and preparing the yard for winter. 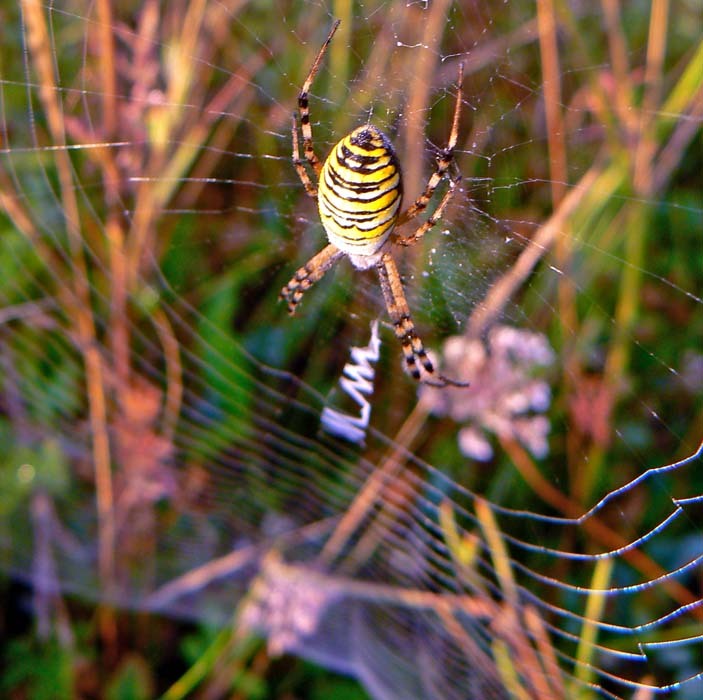 Another garden spider out in the vineyard. We've seen a lot of them this year. By the time fall arrives, we should pretty much moved around and cleaned up. Then we can shift our labor to garden and yard, preparing it for winter. But it is all worth it to have the new space. There will be photos once we've moved some things. Right now there's nothing much to see except big expanses of white walls.